The above saying is one that I hear all the time and I have started to realise it's true. I suppose starting a new job means I am learning more than I would usually as I now know where things are filed, how things are done in a whole new place and I've met a whole new set of people (most of who's names I know) in the last two weeks. But apart from the things I've learnt at my job I've realised a lot of things about myself recently, do you ever have times like that, or is it just me? So in honour of the fact that I've learnt lots recently I thought I'd share some of those things with you right here. 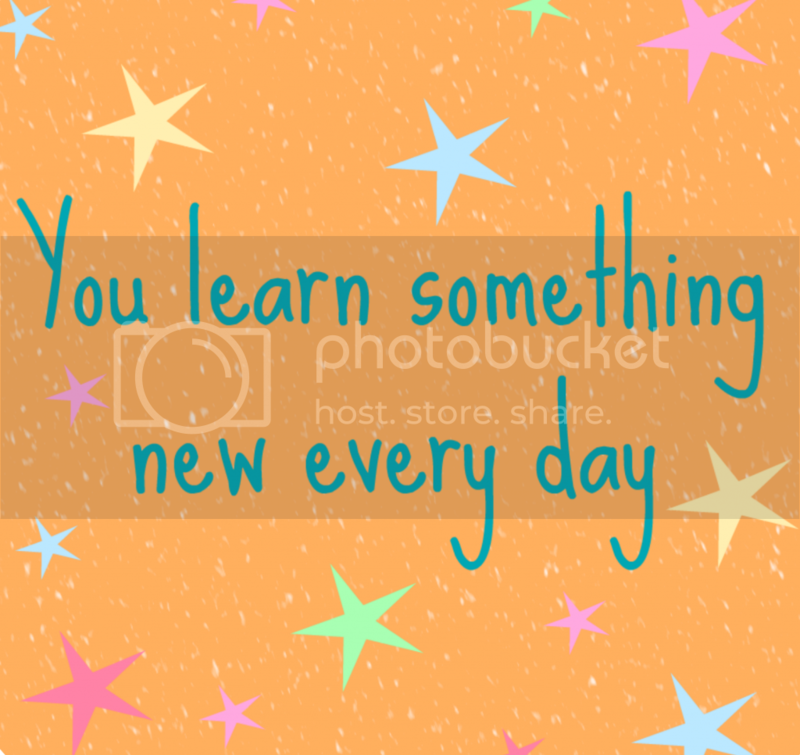 If you've learnt something about yourself or just something useful recently I'd love to hear it, after all you might teach me something new! My obsession with the all the Marvel films and TV show knows no bounds! The most recent episodes of Agents of Shield have been pretty awesome and the one where Simmons almost died was pretty stressful stuff. As for the Marvel films, the most recent Thor film (The Dark World) was superb with lots of awesome Loki action and the trailer for next year’s Captain America: The Winter Soldier looks AMAZING. I can’t wait for it to hit screens and I'm so glad they've worked out a way to have good character specific films and good ensemble films/shows like The Avengers and Agents of Shield. Go Marvel. That The Hunger Games trilogy really is pretty awesome and the underlying messages and morals in it are pretty lofty for a YA book. It’s most definitely a great example of why YA books are for ALL adults and not just the younger ones. How to make chicken liver pate. Yes this sound absolutely absurd and posh but I learnt this recently and it’s soooo much easier than you would anticipate. Also it was tastier when it was home made and not shop bought, as unlikely as that seems! How awesome it is spending time with my family. From lovely meals out and 10k runs, to walks in the country and days squealing over Christmas items; there’s been a lot of Evans family love recently and it’s been great. My nearest and dearest really are quite awesome. That I can be easily distracted by a window. Yes another ridiculous thing to say, but it’s true. My new desk at work has its very own window view overlooking lots of buildings and up towards the parks north of London and I keep getting mighty distracted by all the things I see. Including the most stunning sunsets. Just glorious. That I would almost kill for a peppermint hot chocolate from Starbucks. Having only recently tried them I can report that they are simply delicious and need to be sampled by one and all. Possibly better than last year’s praline mocha (yes I really did say that, but they are just that good). Butternut squash puree on a pizza is pretty awesome, in fact it's so good that it's totally worth an hours wait for a table. Picmonkey is changing my blogging life - I'm totally loving it. I like that I can be a little bit creative when I have zero creativity! How to spell 'live', 'life' and 'live' and their different meanings. I am aware of how absurd that sentence sounds I promise, it's just I've never got the hang of how you spell each one. Thankfully the sisterlings have been trying to drum this into my recently and I think I'm now there. I only own two long-sleeved jumpers, yes really! How is that even possible? Of the ten jumpers that I have how can only two of them have warm enough for the current freezingness we're experiencing. That's just craziness, oh and an excuse to go clothes shopping again - right?